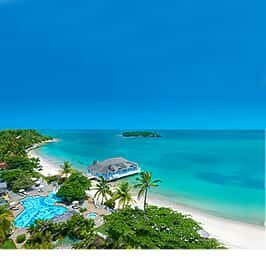 Set along an unspoiled stretch of perfect, white-sand beach, Sandals Halcyon Beach offers beachgoers magnificent views and a perfectly tranquil place to relax. If you're looking for a little more activity, take to the water on a kayak, a paddleboard or a sailboat, or explore beneath the waves with some snorkeling right from the beach. The New Paradise Pool is a treat for the senses, surrounding you with the gentle lapping of waterfalls and lush greenery. This brand new pool is the Caribbean’s longest, measuring 600 feet and meandering through the resort’s newly renovated areas, including the all-new Crystal Lagoon Walkout Swim-up rooms. Located just steps from one of Saint Lucia's finest beaches, these romantic escapes feature direct swim-up access from your patio to the tranquil Crystal Lagoon pool. Relax poolside or in your own outdoor Tranquility Soaking Tub™ for two while taking in the striking views of the Caribbean Sea. A global team of international chefs create an all-inclusive dining experience with gourmet cuisines from around the world. Enjoy fresh seafood at Kelly's Dockside over-the-water restaurant, classic Italian at Mario's, tasty stir-fry at Kimonos and delectable sushi at Soy Sushi Bar. Trained in accordance to exacting standards by the Guild of Professional English Butlers, our unprecedented Butler Elite Service provides a supreme standard of service and luxury where your every need is anticipated. 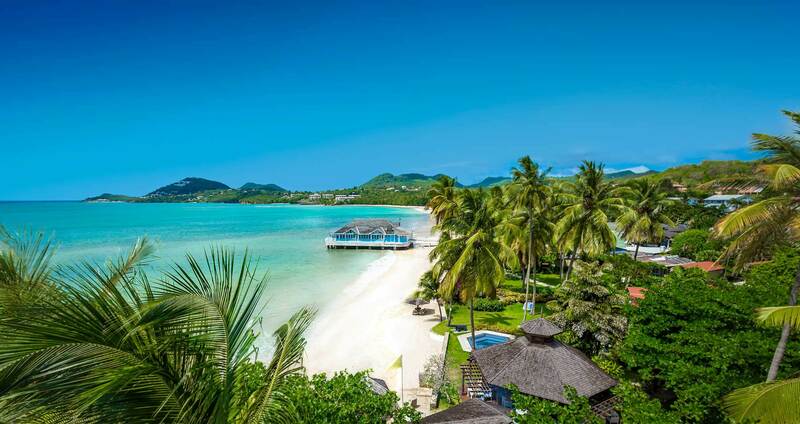 Club Sandals privileges, including private check-ins, weekly activities, and access to the Club Sandals Lounge, are included for guests who book a Club level room or above. 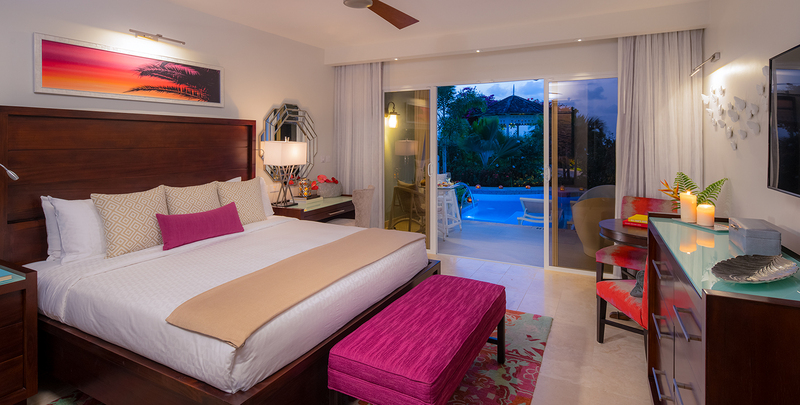 Experience a new standard of luxury at Sandals Halcyon Beach with newly renovated rooms & suites, as well as the all-new Beachfront Honeymoon Butler Suites with private plunge pool. Embark on a culinary journey around the world, where sumptuous cuisine is the perfect prelude to romance. There are six scintillating gourmet restaurants to choose from, each waiting to delight and surprise you. It's a global culinary extravaganza - and you'll never even have to leave the resort to enjoy it all. 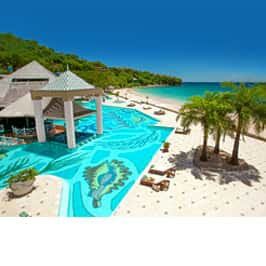 In Saint Lucia you get a mega-vacation that includes 3 resorts for the price of one. Experience all the restaurants, all the beaches and every amenity. Plus, round-trip transportation is included between resorts. 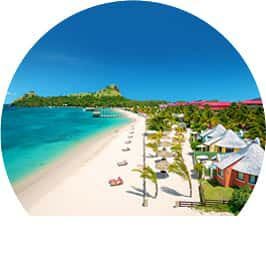 Book any Sandals Resort (excluding INN) vacation of 6 nights or more to be eligible to receive a Sandals Branded Wine Basket & a $250 Spa Credit & a Free Candlelight Dinner for Two by April 26, 2019. IMPORTANT NOTE: This promotion WILL NOT have a registration page; you must enter the respective promo codes EGGSTRALUV when completing the booking in order to receive this promotion's offers. Travel Window: Apr. 24, 2019 - Dec. 26, 2020. Blackout Dates apply. Offer valid for booking made during April 24 - 26, 2019. Offers valid for bookings traveling April 24, 2019 - December 26, 2020; blackout dates apply.